The major objectives of this manual are to provide students with hands-on experiences that are relevant, easy to understand, applicable to the students life, and presented in an interesting, informative format. Ranging from field and lab experiments to conducting social and personal assessments of the environmental impact of human activities, the manual presents something for everyone, regardless of the budget or facilities of each class. Sixteen of the twenty-two exercises are new and the others have been extensively revised. New exercises are 1, 5, 7-10, 13-22. Exercise 2, Habitat and Niche, is a modification of exercise 5 from the previous edition. Exercise 3, Community Structure, is a modification of exercise 2 from the previous edition. Exercise 4, Estimating Population Size, is a modification of exercise 3 from the previous edition. Exercise 6, Historical Changes in Human Population Characteristics, is a modification of exercise 9 from the previous edition. Exercise 11, Personal Energy Consumption, is a modification of exercise 20 from the previous edition. Exercise 12, Insulating Properties of Building Materials, is a modification of exercise 19 from the previous edition. 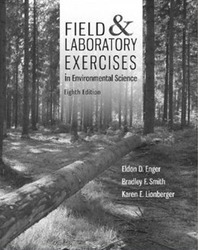 The previous 7th edition of the lab is still available in Create (http://create.mcgraw-hill.com). If customers want an update lab but still are attached to labs from the previous version you can mix and match with Create. Eldon D. Enger received a B.A. and an M.S. from the University of Michigan. He is professor emeritus of biology at Delta College, where he taught biology, zoology, and environmental science and was active in curriculum and course development. Professor Enger is an advocate for variety in teaching methodology and feels that if students are provided with varied experiences, they are more likely to learn. Professor Enger's classes include writing assignments, student presentation of lecture material, debates by students on controversial issues, field experiences, individual student projects, and discussions of local examples and relevant current events. Professor Enger was a Fulbright Exchange Teacher to Australia and Scotland, received the Bergstein Award for Teaching Excellence and the Scholarly Achievement Award from Delta College, and participated as a volunteer in Earthwatch Research Programs. Brad is the Dean Emeritus of Western Washington University in Bellingham, Washington. Prior to assuming the position as Dean in 1994, he served as the first Director of the Office of Environmental Education for the U.S. Environmental Protection Agency in Washington, D.C. Brad also served as the Acting President of the National Environmental Education and Training Foundation in Washington, D.C., and as a Special Assistant to the EPA Administrator. Before moving to Washington, D.C., Dean Smith was a professor of political science and environmental studies for 15 years, and the executive director of an environmental education center and nature refuge for five years.